It is a good addition I think. The Herbert Street tower will become more of an addition I think if we see the Number 5 plot happening as a tower and if J R Smart's John Street tower comes off. Then it'll be a little cluster of towers. It's also a little less interesting looking than the Bridge Street one I think. As for what's next, who knows?! I think it's between the Interchange and Premier Inn on Customer House Street. After that maybe the Newport road tower seeing as Howells are moving offices in July (I'm being optimistic on this one I know!). All the others have been quiet for a while press wise haven't they? I think the John Street development might wait until after Capital Quarter has finished, but that's just me guessing. I'm not sure the Bridge Street Tower is quite as dormant as we think. It was mentioned in a press release by the architects earlier this week. 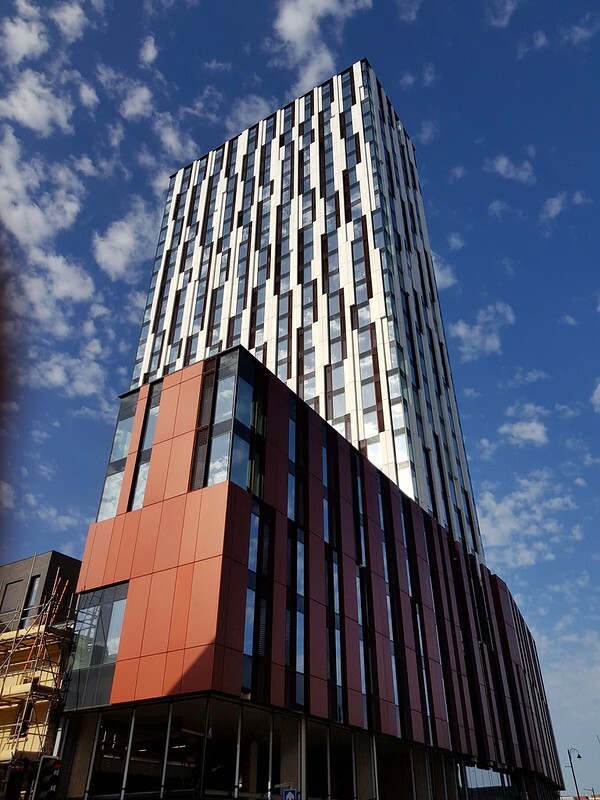 Rio has also designed several of Cardiff’s new student accommodation buildings with the most recent project being the 26-storey student block on the corner of Bridge Street and Charles Street in the centre of the city. The company is also working with developer, Watkin Jones on a new 42-storey student accommodation building on Customhouse Street, which, at 433ft high will be the tallest residential building in Wales. Outside of Wales, Rio has worked on projects throughout the UK and as far afield as Moscow and Madrid. Well done getting those pictures of this building with the lovely clouds yesterday evening, Paul. Yeah, +1 to Paul for regularly updating the Cardiff Developments Flickr page! I check it daily and it's good to see the city from more unusual angles and at all times of year. The Charles Street tower has turned out alright, hasn't it? It's a fine-looking building. It's a relief to see the heavy use of glass in this and the CSQ buildings, much more preferable to the heavy use of stucco in the '00s constructions (Landmark Place, the Aspect, Altolusso, Ty Pont Vomit) which ages and weathers badly and can feel quite oppressive, especially on a grey day. It does look good, but why does the black brick section have windows with bricks instead of glass? Mixed feelings on this one. Tower portion looks terrific (despite lack of resemblance to renders), the red cladding on the base is odd, and the expanses of black brick appalling. I like this one especially as there is nothing really like it elsewhere in Cardiff. Does anybody know what is going in at street level? Restaurants perhaps? The red base and black brick are the best bits, the rest is crap.